KATHMANDU, Oct 19: President Bidya Devi Bhandari received the tika of Shree Nawadurga Bhawani (the Goddess Nawadurga) at the auspicious hour of 9.51 am as per the Vedic rituals on the occasion of Bijaya Dashami festival today. The Head-of-the-State received the tika and Prasad, tilak, jamara and the rakshyasutra from the main priest at the Hanumandhoka Durbar, Devraj Aryal, and the priest at the Office of the President, Hemchandra Dhakal. The chief priest Aryal and other priests sprinkled the holy water from a specially-anointed urn on the President amidst the chanting of Vedic hymns on the occasion. The special urn is anointed on the day of Ghatasthapana following the Vedic rituals of inviting the goddess Nawadurga Bhawani to reside in the urn and give her blessings. The special ritual urn filled with holy water, jamara, tilak and rakshya sutra were brought to the President House from Hanumandhoka Dashainghar where these auspicious items had earlier been anointed following the Vedic rituals and procedures on the day of Ghatasthapana. President Bhandari offered tika, jamara and offerings of money to the chief priest and the priests at the President’s Office. Before this, the President performed the worship to the holy lamp, the special urn and to god Ganesha. A contingent of the Nepalese Army played the soothing mangaldhun or the auspicious tune, as all the rituals associated with the offering of tika and jamara were in progress at the auditorium at the President House. 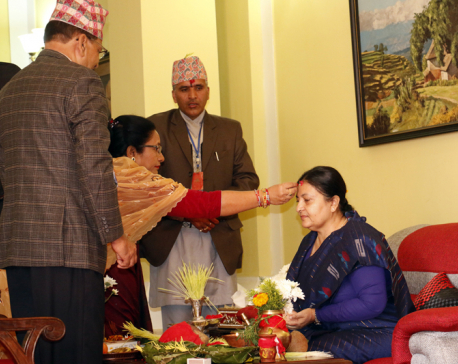 Also this morning, President Bhandari received tika, jamara and monetary offerings from her mother Mithila Pandey. She also received the tika and jamara from her uncle Dekendra Pandey. On the occasion, President Bhandari also gave tika and jamara to her daughters Usha Kiran and Nisha Kusum and sons-in-law Umesh Thapa and Abhisek Yadav as well as to other members of her family.